In the past few months, The Grace Project at Grace Syracuse has been working with youth at the Onondaga County Justice Center on 6 word memoirs. The memoirs are now on display at Grace, with the hopes that they can someday be displayed in other places around Syracuse. There are several more which parishioners of Grace are still working on that have not yet been returned to us. 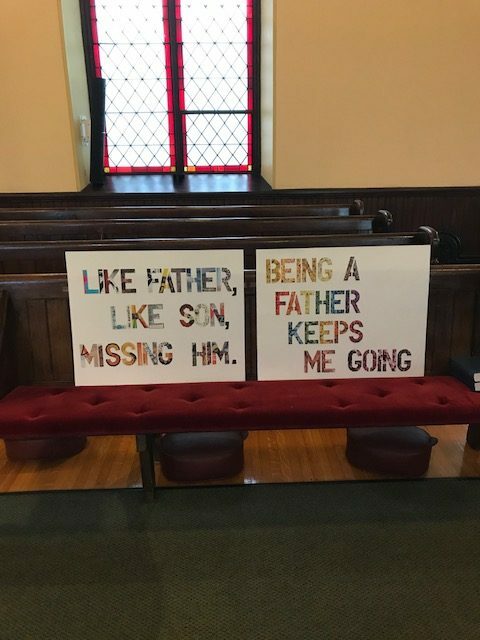 This project both provided an opportunity for the youth to think about and to reconnect with themselves and their humanity; and, for the people of our community, the six word memoirs humanized the youth in a profound and meaningful way. Five or six of the young men who did not initially participate in the program are now asking to have an opportunity to create their own six word memoir. Others would like to create a second. The six word memoirs and other creative programs are valuable tools in helping to reduce behavioral issues and teaching self-worth to our youth who desperately need to be mentored in ways which are restorative and positive. 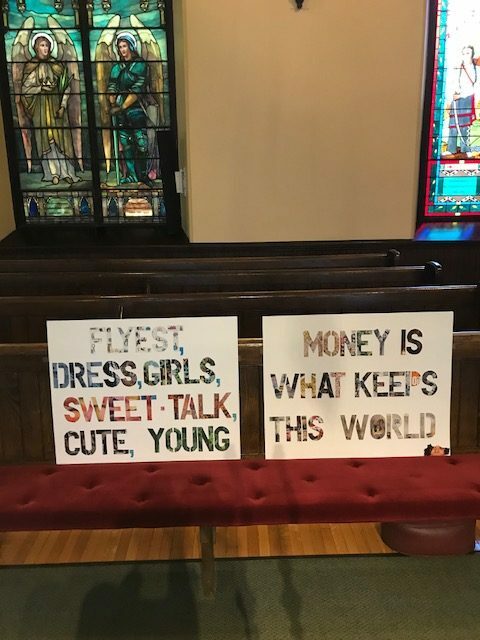 What is so wonderful about this project is that it included both the youth we work with and parishioners — the end result was moving for both the people who did the art work to fill in the lettering and the youth who wrote the six words and then saw them completed. 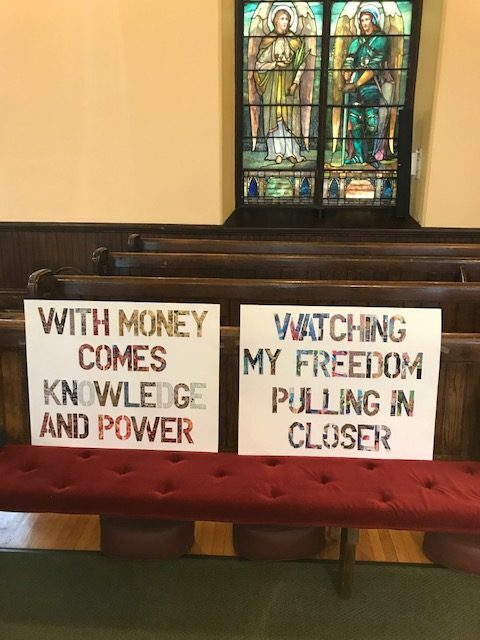 Parishioners at Grace were then invited to take a poster home and fill in the letters using only magazines and glue – in other words, no scissors! The original thought was that they would use only what the youth would have been able to use had they been able to complete the art portion of the project at the Justice Center. At the time, we didn’t realize they couldn’t have glue. 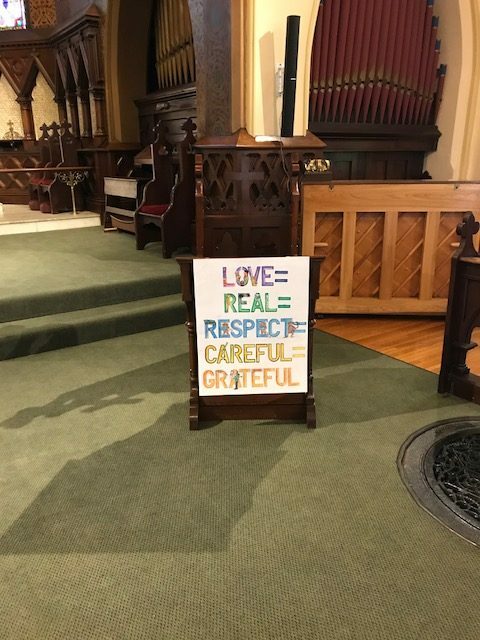 As you will notice, some of our parishioners felt compelled to let their own creativity flow and chose to alter the rules just a bit! Please know that although it may be difficult to see from the photos included here, each completed poster took hours and hours of work as each is made up of little tiny pieces torn from magazines and then glued onto the poster board. By the time this project is completed, nearly a dozen family units from our congregation will have spent time working to complete a poster! Everyone – and we do mean everyone – the youth and our parishioners – who participated thought this project was transformative. The youth were incredibly proud, took ownership, and expressed gratitude for the people who did the art work. They were amazed to see what they had written come to life and they were genuinely moved to learn that there were people who valued them and their thoughts. They were beaming and attentive as each poster was shown to them and discussed. Our parishioners were amazed by what had been written and how the project helped them to see inside these young men. They now see them not as monsters or thugs but rather, as our youth. They expressed empathy for them and continue to pray for them. Many expressed an interest in learning more about them and how they might help support them.